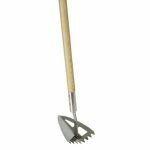 Mid-size multi-function garden tool with narrow head. 25% smaller head than the original Backhoe. Gets into tighter spaces and is lighter weight. Tempered stainless steel blade and long ashwood handle.